Irish Trucker spoke with road Maintenance Manager Marian Lewis to learn the ins and outs of what maintaining a busy stretch of almost 38km exactly entails. The M4-M6 motorway links the N4 and N6 National Primary Routes west of Kinnegad, Co Westmeath to the existing M4 motorway at Kilcock, Co Kildare. The scheme begins at the end of the existing M4 motorway at Kilcock, from where it passes south of the R148. A full grade separated interchange is provided at Kilcock connecting the Naas road to the Trim road. The route continues towards Cappagh Hill, passing to the south of the Cappagh GAA pitch, crossing the Ballycorron River and continuing towards the regional road between Edenderry /Johnstown Bridge and Enfield, passing to the north of Johnstown House. A full grade separated interchange is provided to serve Enfield and Johnstown Bridge along with the Trim and Edenderry roads and links with the Enfield relief road. The route continues passing south of the railway and the Royal Canal, crossing the rivers Blackwater, Togher, Aleckafin, Glash and Boyne. It crosses the regional road to Edenderry and the Kinnegad River passing south of Kinnegad. The route provides free flow connections to the N6 (Galway) and N4 (Sligo) to the west of Kinnegad. At Kinnegad grade separated interchanges are provided on the N4 and N6 links. Over and underpasses are provided to cater with the local traffic through the motorway junctions. 2017 sees the M4 Motorway entering into its 12th year since its completion and Marian Lewis has been its Maintenance Manager for six-and-a-half of those years. When we spoke to Marian in December, she was good enough to take time out of her busy schedule to give us the lowdown on what her maintenance department does. “The maintenance depot is at the Enfield junction and there are 12 full-time staff working here,” Marian outlined. “I’ve been the Maintenance Manager for six-and-a-half years now and the road itself would be open 11 years in total. In her role of almost seven years now in total, Marian views the Maintenance Manager’s position as one that requires her full attention all year round. What goes on in maintaining the road during the winter and summer seasons may contrast, but both are equally important and this time of year can often put Marian and her colleagues to the test, particularly when temperatures begin to dip to the low digits and negative numbers. “Winter maintenance starts on October 1st and from that point on we’re on high alert, especially leading up to Christmas,” said Marian. “Summer maintenance comprises mostly road sweeping, litter collection and landscaping and with approximately 37-and-a-half kilometres of road, it’s very much a full-time job for everyone involved. From December through to March, just like any major motorway in the country, the winter conditions can become challenging. Eurolink Motorway Operation Ltd is responsible for the winter maintenance activities on the M4/M6, including precautionary and reactive treatments of the road. The winter maintenance period commences on October 1st and lasts until May 15th and Eurolink Motorway Operation Ltd, as the Public Private Partnership (PPP) Company on the M4/M6, has the responsibility for execution of the Winter Maintenance arrangements on the road, with the aim of ensuring the safe movement of traffic, road users and the general public on the road, and with the additional aim of minimising any delays caused by adverse weather conditions. To ensure this, Eurolink monitor the road and weather conditions from the start of October until mid-May so that the necessary precautionary treatments are applied to the road, and a rapid response is made to any deterioration of prevailing weather conditions or forecasts. 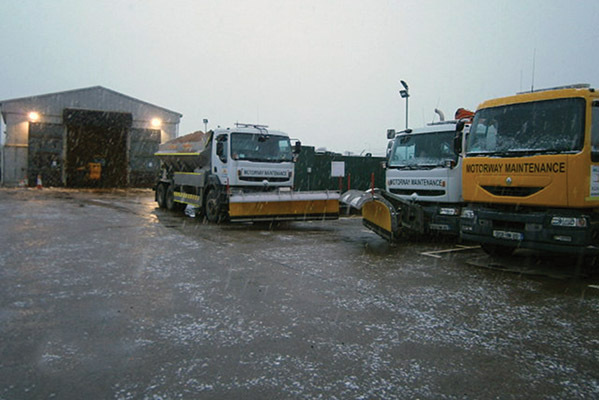 Eurolink’s winter maintenance policy is available and can be viewed by third parties at the Customer Services Office in the Enfield Maintenance building (see address below). A trusted and highly-valued employee of Eurolink’s, Marian has gained great experience since becoming involved in this industry. Also crucial to the road’s safety is the excellent staff around her in Enfield, as they are put to the test day in, day out with some of the challenges that they face. A new year will very much be about the same thing for Marian and co – ensuring the drivers’ safety on the M4/M6 until 2018 presents the same challenges again.